We can always rely on House of Boom to pull through with an amazing deal that will make even the most frugal of mamas smile from ear to ear! They are back at it with their Winter Deal. Haven't heard about it yet? Don't worry - we're here to give you the scoop. Your Winter Pass grants you access to the House of Boom park for an hour and a half anytime during open park hours Monday through Friday. 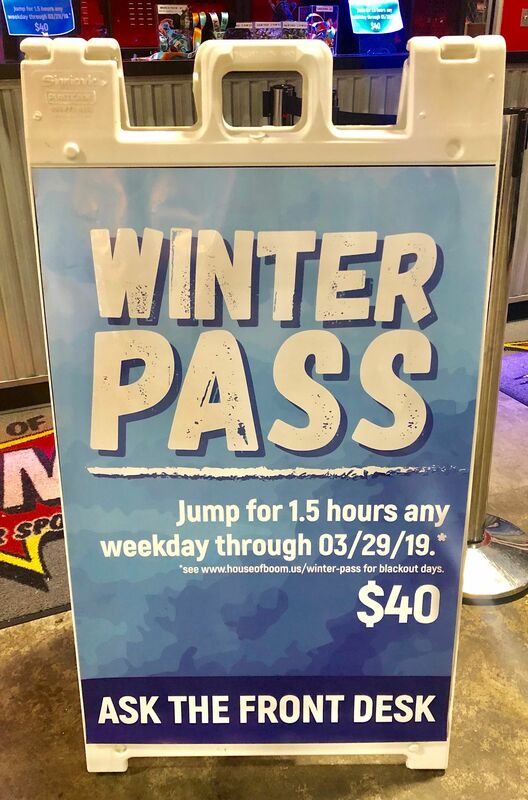 The pass is valid 1/14/19 - 3/29/19 so there's plenty of time to get your money's worth! If you've never been to House of Boom, this is the perfect opportunity. We know once you try it, you'll be back so why not go ahead and get those future visits secured. Whether you're trying to wear the kiddos out so they'll stay chill during Strides or letting them get out their energy before taking what we are sure will be an epic nap, House of Boom is for YOU! Call them today to get more info or head over to their webpage now to purchase yours.